In light of funding cuts and the increasing emphasis on the digital sphere, the Director and Curator of the recently launched International New Media Gallery offer a view on the relationship between online and physical space. The International New Media Gallery (INMG) is an online exhibition space that was launched in November 2012. Althought it was not conceived as a direct response to the current funding crisis threatening the vitality of the arts in the UK, its conception is a reflection of the potential of the Internet as an expanded territory, with regards to the distribution and accessibility of contemporary art. For us, the proposal that the Internet might be a viable solution to the closure of galleries and museums follows an unjustifiable logic that considers art to be of little significance to the public sphere. It is the intention of the INMG to participate in the development of the Internet as an unprecedented platform for global communication and the accessibility of information. The INMG does not claim to revolutionalise the way an audience experiences contemporary art, but sees itself as engaging in an evolutionary process that can offer the potential for the distribution of contemporary art across an international network. The INMG is an attempt to offer an extra definition of the gallery space. Our intention is to navigate the cultivation of a virtual architecture in addition to the conventional art gallery, fostering discussion across various platforms. We see the Internet as a ‘para-site’; that is, a virtual space made up of multiple sites of articulation, that nevertheless function in relation to the properties of physical space. In this sense, the INMG can be seen to operate alongside the physical art gallery, and extend the boundaries and possibilities of exhibition into the expanded territory of the World Wide Web. In our view, the Internet should not be seen to corrupt or attempt to collapse the value of real space, but should instead enter into dialogue with physical sites. From this perspective, the INMG does not attempt to replace a gallery-going culture, but aims to engage a wider audience and encourage greater interest in contemporary art in general. The INMG focuses on digital and lens-based media, which lends itself particularly well to the Internet as a platform. Our current exhibition, Corinne Silva: Wandering Abroad, is accompanied by an academic catalogue, an online discussion platform and offline events. Our project was never intended to be online only. From the beginning we have considered the hosting of offline events as fundamental to our curatorial practice. That we occupy virtual space rather than a permanent building allows for flexibility and mobility beyond the conventions of the traditional gallery setting. The project is very much in its infancy, and everyone involved is excited to see how it will develop. So far we have hosted events in Brighton and London, but our online audience has expanded around the world to over 25 countries across six continents. We hope that in the future the nomadic ambitions of the International New Media Gallery will be reflected in our online and offline content. We are the migrant gallery. 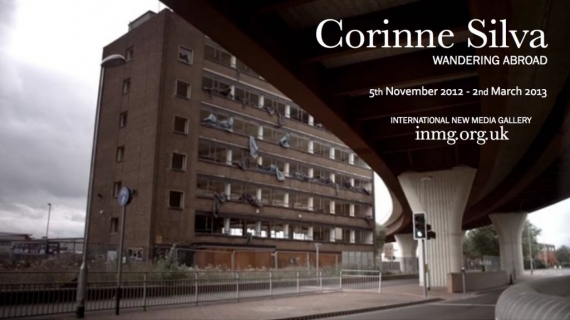 Corinne Silva: Wandering Abroad continues until 2 March 2013.